Transient uses only one cake of Concentric, 437 yds (200 grams). The yarn is worsted and this knitting pattern is worked with a US 8 (5mm) needle. The going rate online for Concentric is about $50.00 a skein, some are gouging at $59.99, but I have found a few mini bargains, too. Webs, in Northampton, Massachusetts, has five colors of Concentric at $47.95 plus shipping. A yarn seller on Amazon presents the cakes in seven different colorways at $49.95 with free shipping. The display of color choices is exceptionally good on Amazon, but it looks like there are only two available at this writing: "Burbs" and "Heart Strings". I found the best price for Concentric at Graywood Designs in Pigeon, Michigan at $38.95, plus shipping and sales tax, $48.29. The platform for choosing your favorite color yarn cake is excellent. There are several color yarn cakes in stock with others on backorder. 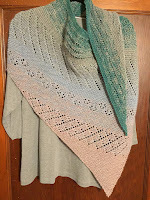 You will find the free pattern for Transient on Ravelry. You must download the instructions to your device now, as this pattern is only free until June 1. Saving the pattern to your library does not save the instructions. This pattern is a working KAL very near the end, sponsored by Skacel Yarns. You can find the extensive instructions from Michelle Hunter here on at Knit Purl Hunter. Thank you to joskein for the use of her photo.